Where to find Saginaw hotels near an airport? Where can I find hotels in Saginaw that are near tourist attractions? If you're thinking of visiting Saginaw Bay and you're looking for a hotel in Saginaw, you have a wonderful array to select from. Spend some time exploring our 20 hotel options, all of which can be found within a 0.1-kilometre (0.06-mile) radius of central Saginaw. One of only a handful of hotels that are close to the center of Saginaw, is the Montague Inn. Bay City, 19 kilometres (12 miles) from downtown Saginaw, is a popular accommodation neighborhood that is home to 12 Expedia-listed hotels. The DoubleTree by Hilton Hotel Bay City - Riverfront and Holiday Inn Express Hotel & Suites Bay City are some of the Expedia-listed choices in this area. Also popular with those exploring this area is Frankenmuth which is an alternative Saginaw hotel neighborhood that is 20 kilometres (12 miles) from the middle of Saginaw. The Fairfield Inn by Marriott Frankenmuth and SpringHill Suites by Marriott Frankenmuth are among the 6 accommodation options in Frankenmuth. 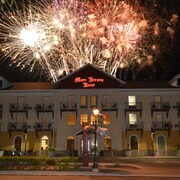 Alternative areas with a range of hotels include Bridgeport and Midland. The Baymont Inn & Suites Frankenmuth/Bridgeport and Knights Inn Bridgeport are in Bridgeport, while Midland is where you'll find the Residence Inn Midland Marriott and SpringHill Suites Marriott Midland. Birch Run is 25 kilometres (15 miles) from Saginaw's downtown, while Auburn is 25 kilometres (16 miles) from the heart of Saginaw. The Holiday Inn Express Birch Run - Frankenmuth Area and Comfort Inn Birch Run - Frankenmuth can be found in Birch Run, while Crystal Inn Hotel and Suites and Farmhouse Bed & Breakfast are situated in Auburn. The Saginaw area features a selection of economical accommodation options sure to delight even the thriftiest travelers. 25 kilometres (15 miles) away from Saginaw's downtown area is where you'll find the Best Western of Birch Run/Frankenmuth. 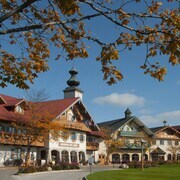 The Bay Valley Resort & Conference Centre is just 14 kilometres (9 miles) away. The Americas Best Value Inn - Birch Run / Frankenmuth Area and the Sleep Inn Midland are alternative affordable options well worth looking into. 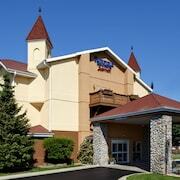 The Hampton Inn & Suites Saginaw is located 6 kilometres (4 miles) from the middle of Saginaw. 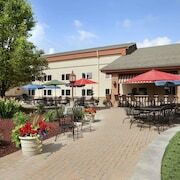 Another hotel is the Residence Inn by Marriott Saginaw, which is situated 6 kilometres (4 miles) away. 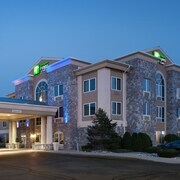 More alternatives around Saginaw include the Holiday Inn Express Hotel & Suites Saginaw and the Fairfield Inn Saginaw. For those keen to see more of the rural landscapes and lakes that feature in this region, you could also plan some time in other parts of Saginaw Bay. You could travel to the region's points of interest or enjoy hiking and then find a convenient hotel to stay the night. 85 kilometres (54 miles) from Saginaw you'll find Bad Axe, home to the Pioneer Log Village and Allen House Museum. Expedia-listed Bad Axe hotels and accommodations include the Holiday Inn Express Hotel & Suites Bad Axe and Ameriway Inn and Suites. Alternatively, you could consider staying at Bay City, 19 kilometres (12 miles) to the north of Saginaw, where you can choose from the Fairfield Inn by Marriott Bay City and Bay Motel. If you're staying in Bay City, make sure you visit the Veterans Memorial Park and Bay City Mall. Saginaw is home to some terrific scenic and cultural attractions; learn more by visiting Expedia's up-to-date Saginaw travel guide. What are the most popular Saginaw hotels? Are there hotels in other cities near Saginaw? What other types of accommodations are available in Saginaw? Explore Saginaw with Expedia.ca’s Travel Guides to find the best flights, cars, holiday packages and more!